This time it is truly over. 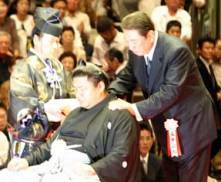 The brilliant career of ozeki Musoyama Masashi finally ended on Saturday, October 1st 2005, with the traditional danpatsu-shiki, the symbolic ceremony where the retiring wrestler has his hair cut. To honour a wrestling career that lasted almost a full 12 years, Takehito Ozo made sure that this dramatic event remained, above all, festive. 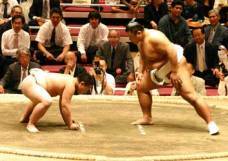 In fact, with his departure, one of the finest pages in sumo history is being turned. Now the only rikishi remaining from the era of the Hanada brothers (the yokozunas Takanohana and Wakanohana III) are the ozeki Kaio and the veteran Kotonowaka. This was really a celebration of reunion and no tears rolled down the ozeki's cheek. According to the custom, Musoyama put on his training mawashi for his final day as an ozeki in order to exercise a bit with those near to him. The children didn't balk from pushing the ozeki's heavy body, admittedly 20 kilos lighter than his retirement weight a year ago, from one end of the dohyo to the other. 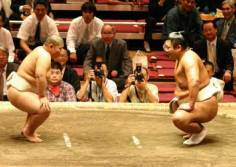 Musoyama also faced students, reminding everyone that he had been a brilliant university yokozuna, blowing all opposition away. But still, the most beautiful and moving moments were when Musoyama sincerely grappled against those who remained of his generation, such as Tosanoumi and Kaio. Kaio was also particularly touched, and even stated to the press: “With his departure, a part of myself disappears.” For Musoyama, finally, it was his last sweat-session wearing his mage, and in the end the ozeki had a distant look as he wiped himself down. At that moment, the 10,000 spectators knew that the spectacle's pinnacle was about to come, and the emotion couldn’t have risen any higher. As the former maegashira Daishi, the greatest 'crooner' among the rikishi, warmed the hall by sincerely and throatily singing sumo songs, Musoyama was off-stage preparing to wear the prestigious oicho-mage (hairdo that only the sekitori have a right to wear) for one last time. Upon his return into the Kokugikan, the bull didn't smile any longer, despite the intoxication of the crowd. His roar was now silent. It was Musoyama's father who had the honour of opening the ball with a pair scissors in his hand. 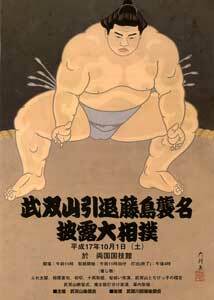 Besides being his father, this emblematic character was also the first sumo master the ozeki had and Musoyama freely admits that he would never had done sumo if it wasn't for him. This father, so strict towards his son for his own good, whispered a compliment into Musoyama's ears before tapping him on the shoulders with both hands. 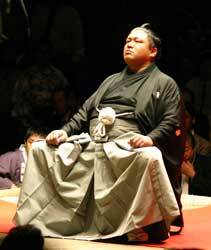 The ozeki only closed his eyes, finding the means to contain his emotions. He was the same all throughout the ceremony, concluded as is the custom by his master, Musashigawa oyakata. 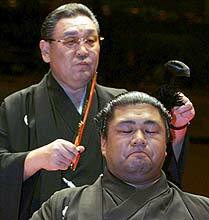 With his new hairdo, Musoyama became the 18th Fujishima oyakata and will be charged with developing new wrestlers. During his final speech, he stated: “From now on I am Fujishima oyakata, and I would like to train strong wrestlers, unique by their talent.” In jest, he claimed he had no real intention to get married, but let us hope that he will still find success and happiness in his new duties. Three cheers for Fujishima oyakata!